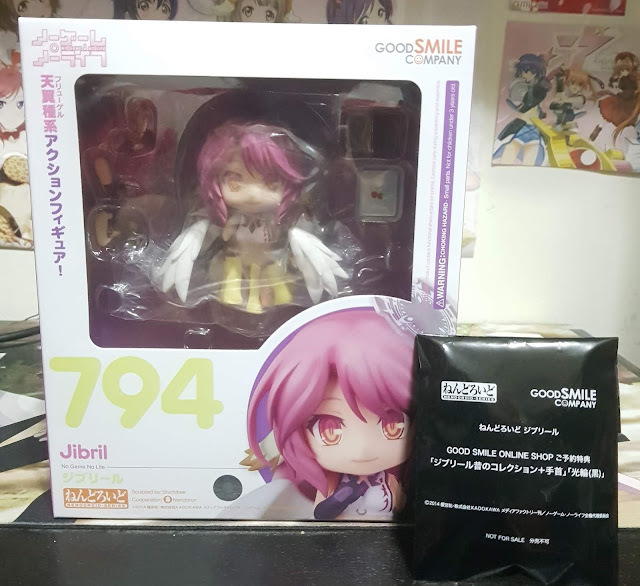 Welcome to a post on Nendoroid Jibril, where I would be unboxing and reviewing her this time round! This Nendoroid has been out in the market for a while now and unlike her scale counterpart, she did not have an equivalent price peak. 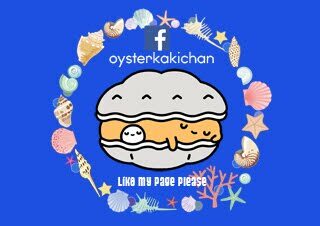 That being said, let's take a look at this beauty! 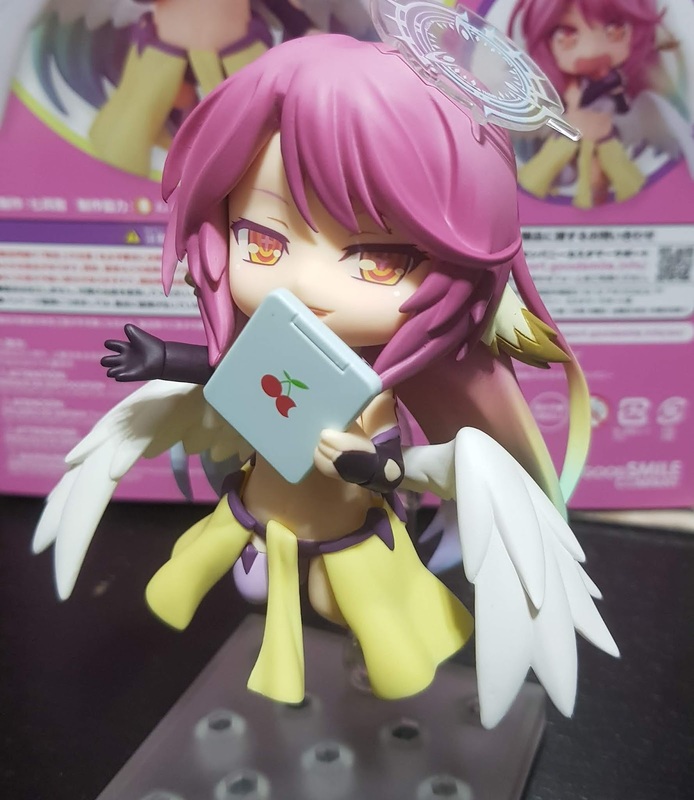 The Nendoroid numbers have certainly increased a lot and very rapidly ever since I started collecting Nendoroids... For Jibril, I decided to get the exclusive version, which leads us to the normal box on the left of the image and the exclusives in the black pouch on the right. The exclusives consist of a skull part, a hand to hold and a black halo. This is reminiscent of her back in the days when they were at war and also ties in perfectly with her scale figure if you decide to pose both with her dark side. 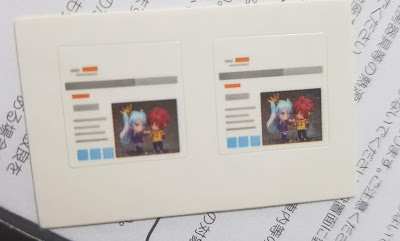 This is a non-exclusive part, but I would like to mention that she also comes with two stickers for you to paste onto her tablet screen. 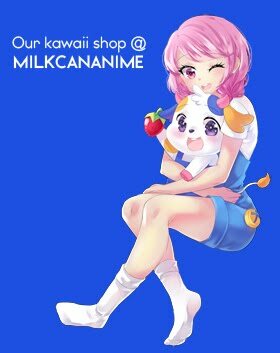 Matching this with her blushing and drooling expression would make it seem like she is incredibly excited over the Sora and Shiro Nendoroids. 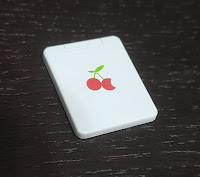 Of course, you can use other stickers (even custom make your own) to use on her tablet to bring out her side that thirsts for knowledge, but I will be sticking with this sticker in this review. 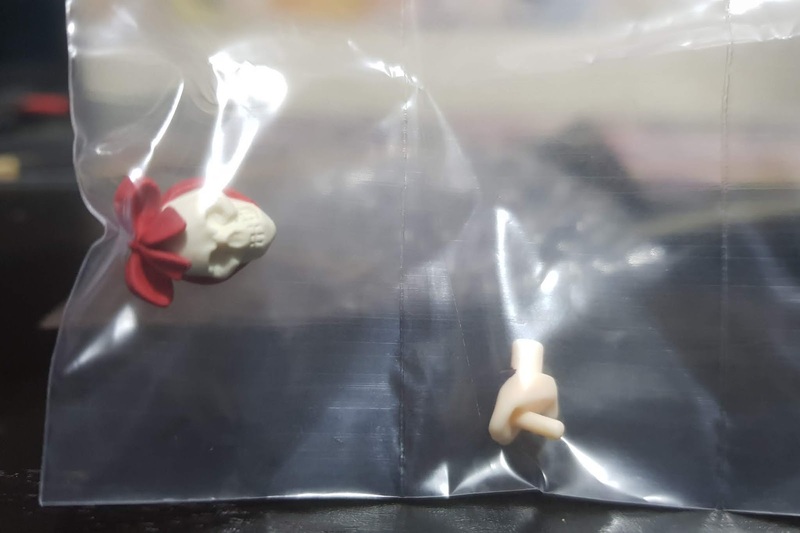 The blister is secure and her limbs (bottom right) actually come with an additional piece of blister to keep it all in place even when you open the larger outer blister. 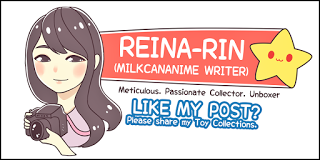 Her faceplates are also rather varied and thus give a very high amount of poseability since you can match her with many different scenarios with Sora and Shiro Nendoroids, or even on her own. 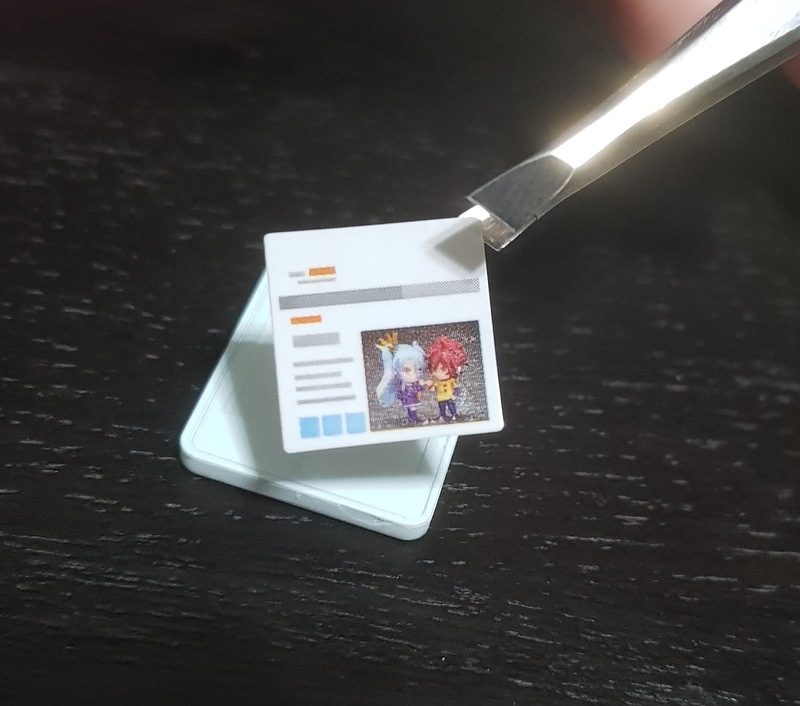 However, she does come with minimal accessories, namely a tablet and book, and the skull if you bought the GSC exclusive instead. 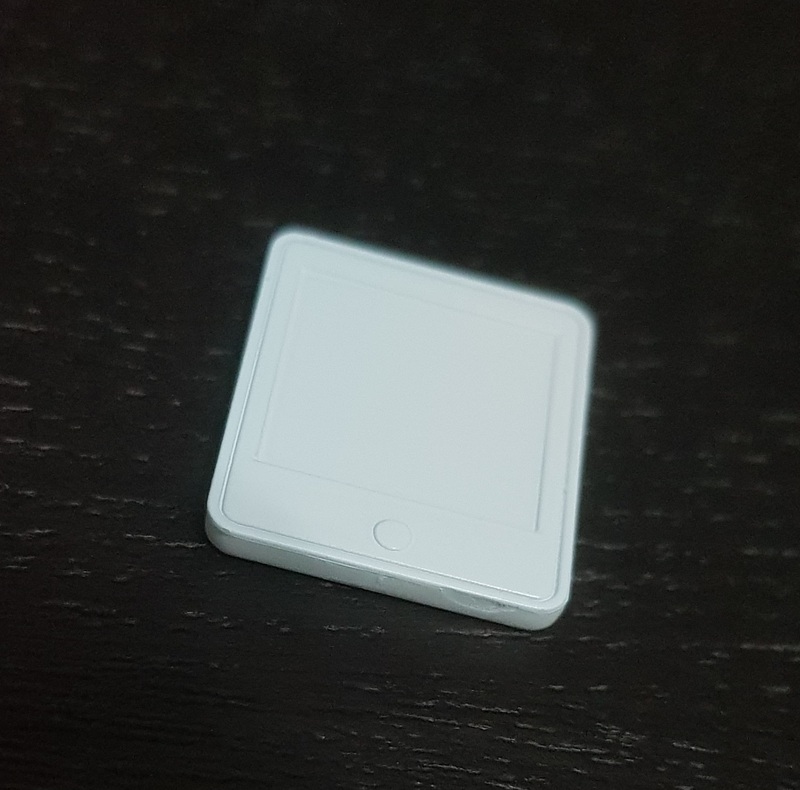 Not much to put in this aspect other than placing the sticker on the tablet. Do note that the back of the tablet comes with the cherry symbol and thus, the sticker should go onto the side that is completely white. 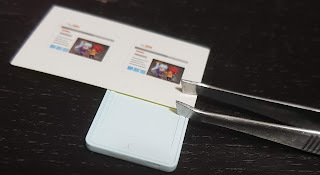 That same side also comes with a sculpted border to guide where the screen lies, and your sticker should fit flush against that same border. There is also a button at the bottom of the tablet, similar to iPads, for an additional touch in design. There are two stickers provided in case you mess up, and as with most stickers, the oil from your fingers would make it less sticky so for most stickers involving small parts such as these, I prefer to rely on a clean pair of tweezers. 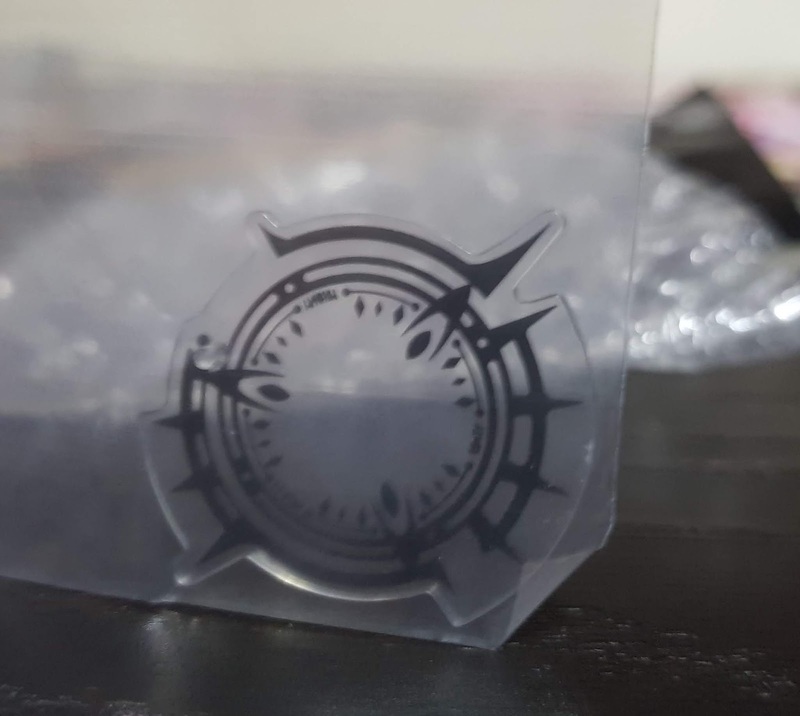 We shall look at her with the normal release parts first. 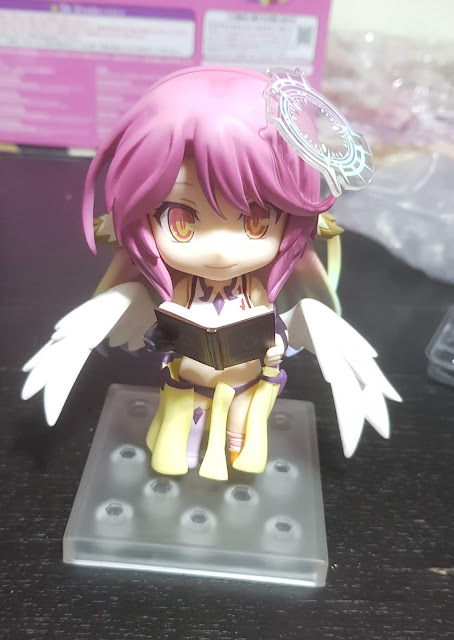 One aspect of Jibril that I really love is how much she likes to read. 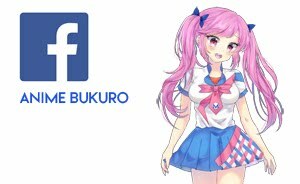 As her expressions are varied but versatile, you can easily match all her three expressions with the book and still have all of them fit. For this, I tried matching her standard expression, which makes it look like she is looking up from her book. I have no further pictures of her book, but it is completely white on the pages. 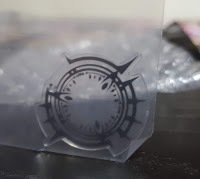 I wished that GSC did print some writing on it, seeing as they took the extra effort to give stickers for the tablet that is held in the same manner. Removing the book from her grip, we will next take a look at her outfit. 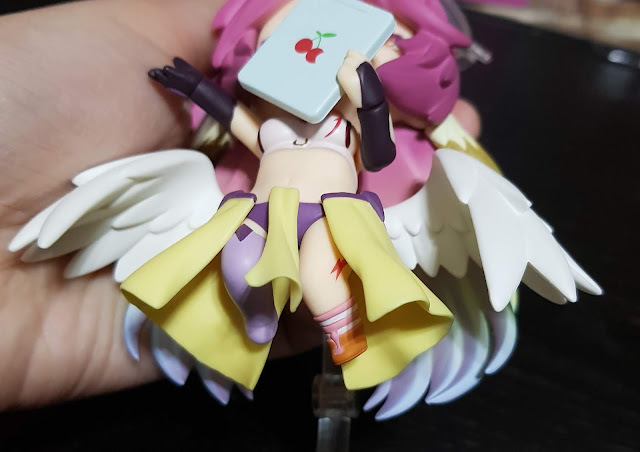 Jibril is rather underdressed and GSC has taken the extra mile and effort to sculpt out the bottom of her ribs to give her a more shapely figure. As usual the paint jobs of the purple hemlines and red patterns on her top is pristine and clean with no paint spillage and transfers. 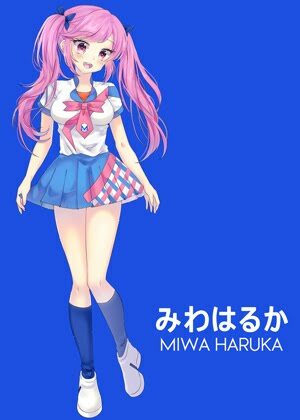 They have also kept her bottoms accurate to her design, especially her stockings which I would cover later. 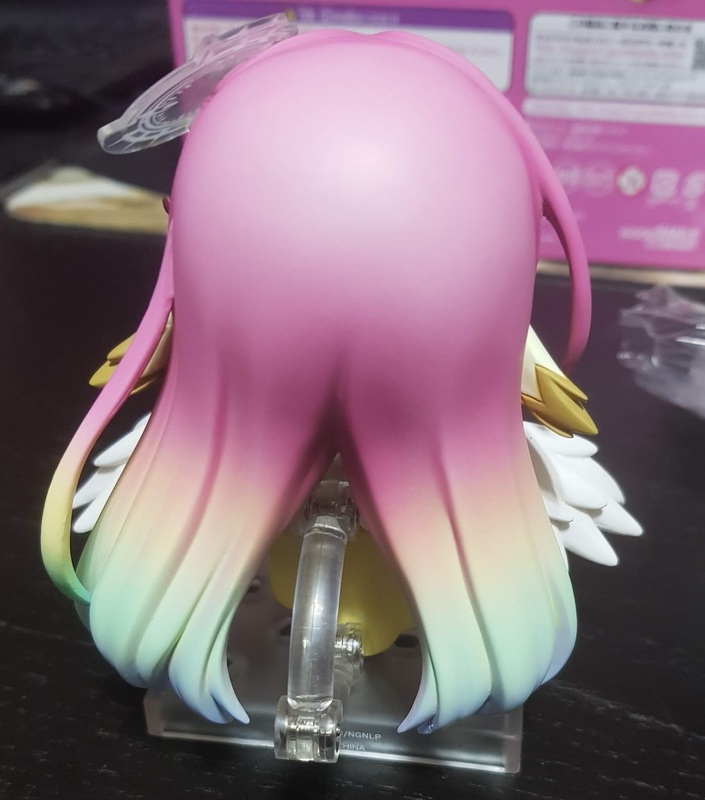 Here, I'll like to mention that the yellow flaps of her bottoms are fitted with joints and can be moved to suit whatever pose you would like to put her in. 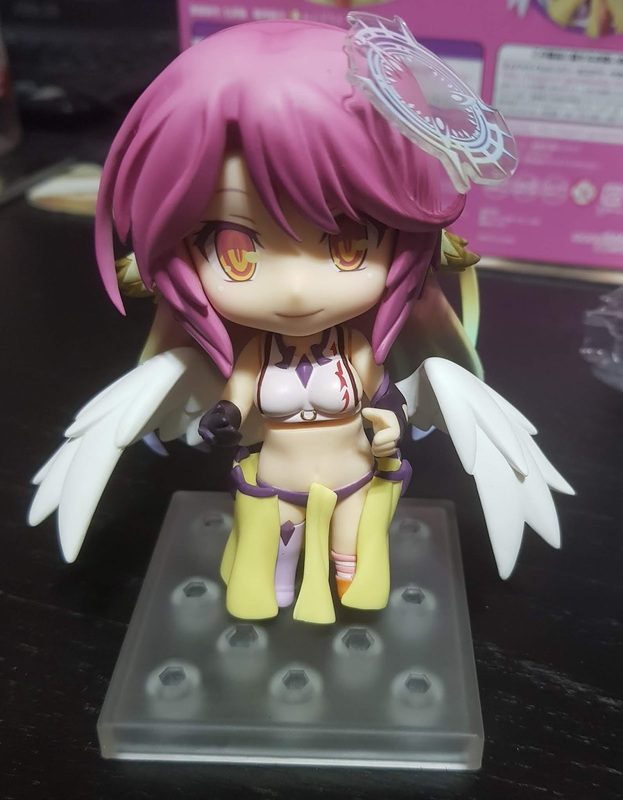 Jibril's wings are delicately sculpted and the chibi sculpt matched with the long white feathers make her wings look both cute and dainty! 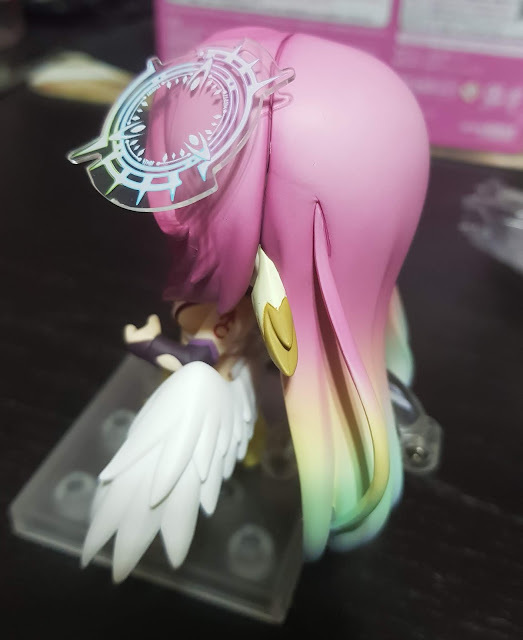 You can move her wings up and down to her expression and pose as well. Her ears are also sculpted in the same manner and comes in two tones, a lighter brown and a darker, more striking brown. 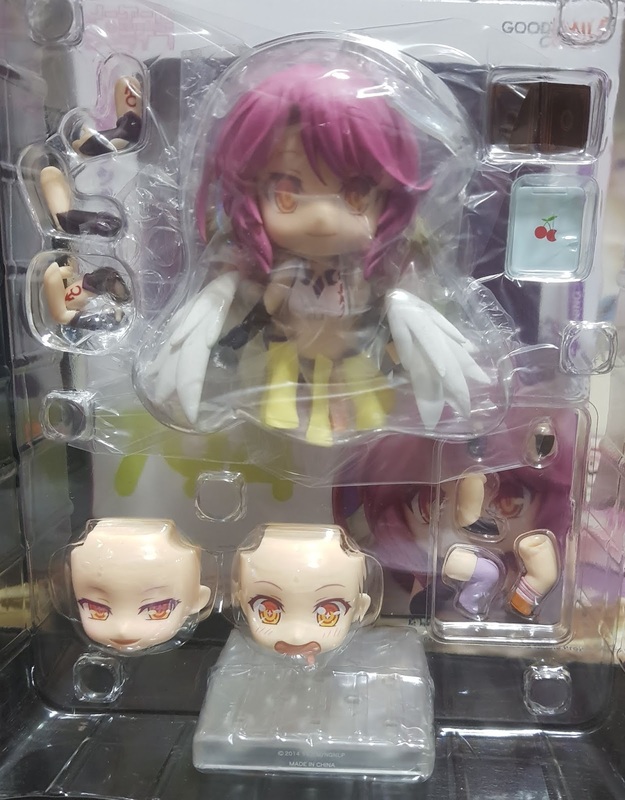 Something that all NGNL Nendoroids have is gradient in their hair and Jibril is definitely not an exception! The colors go from pink to blue and while the light gradient at the tips of her hair looks superb, I do wish that GSC had tired to blend her usual pink hair better with the lighter pinks and oranges. 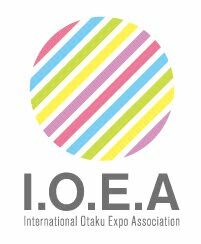 The abrupt switch in colors is rather jarring. 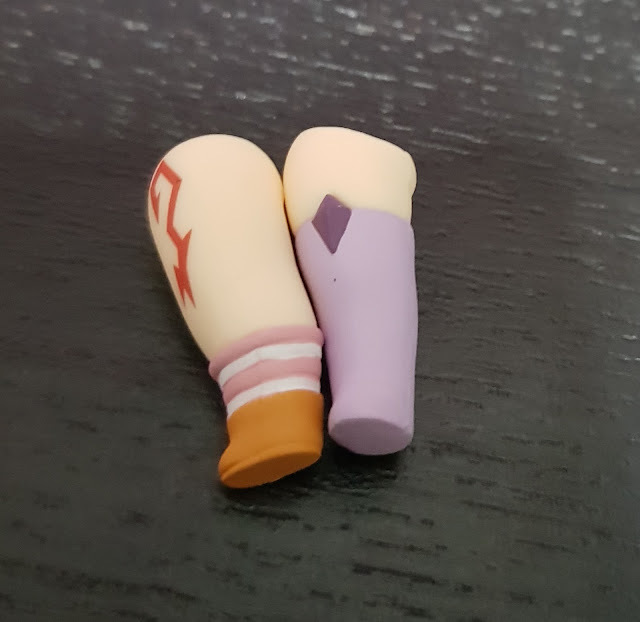 The sculpting of her stockings is accurate and clean for the purple side. The orange sock has a little blemish when it comes to the pink stripes (image below) but can be largely overlooked. However, do note that by having two different feet like this would mean that interchanging the parts would be extremely obvious. She also only comes with straight and bent legs that gives her limited posing in this aspect. And to bring it up to a higher level, I decided to use the exclusive parts which includes the black halo and skull! This really brings out the menacing aspect of her that leaves her fans quaking in their boots! 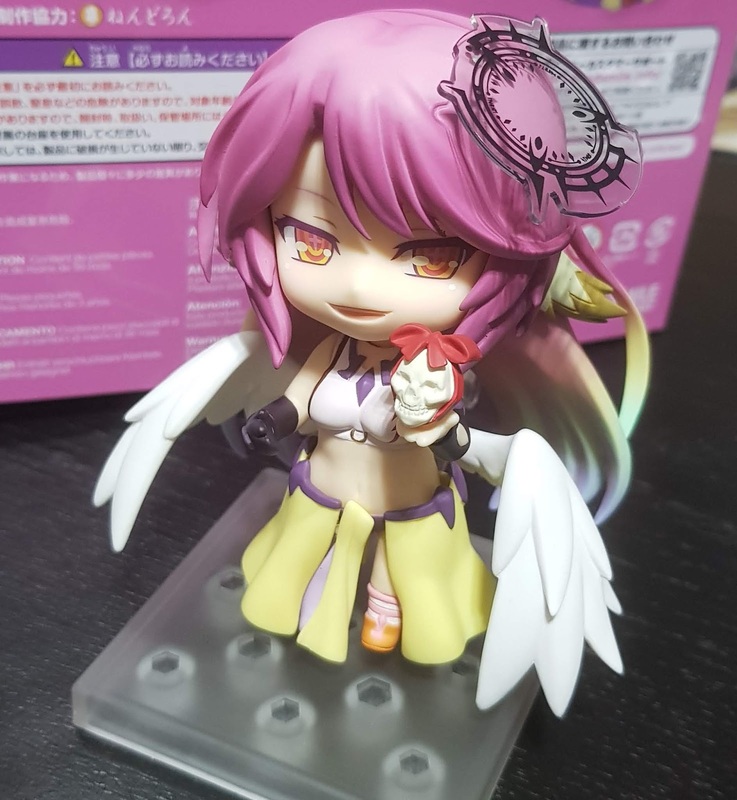 Highly recommended for all Jibril fans as she can match really well with her scale figure. 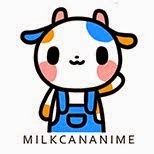 For those who merely want this Nendoroid for interchangeable parts, she has at least two expressions that can be used to enhance other Nendoroids as well. 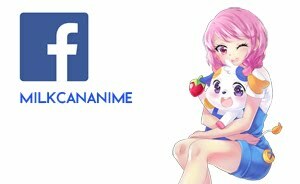 She also comes with accessories such as the book and tablet that can be used as normal day items to match with other Nendoroids! 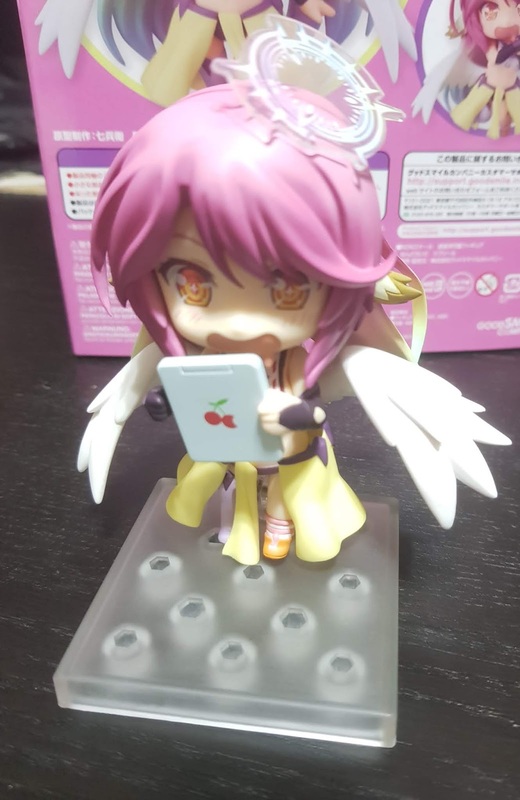 No Comment to " Figure Unboxing and Review: Nendoroid Jibril (No Game No Life) "